Piggy Adventure is named very misleadingly. 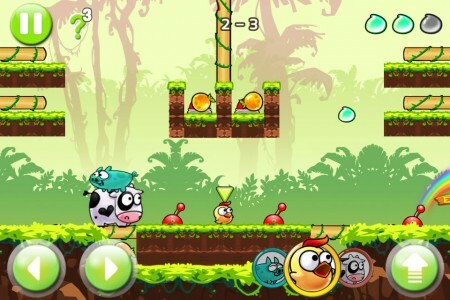 MoboTap’s creation is not the adventure of a pig. 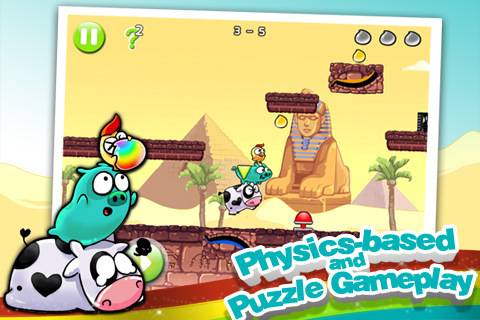 It is the adventure of a pig, a cow, and a chicken, traversing several islands through puzzles and platforms to find the missing colours stolen by an evil force from their home. The way the three characters interact and work together to overcome obstacles is, by far, the game’s greatest strength. The game’s visual style and simple story present something which looks appealing to a five-year-old, but in reality, their mind-bending quest is something almost anyone can enjoy. If there is one gripe about the gameplay in Piggy Adventure, it’s that it holds your hand for far too long. You’ll easily blaze through the first twenty-or-so levels before reaching any kind of cerebral challenge. The sudden difficulty spike from the early stages to the latter is surprising at first, but, in the end, thoroughly welcome, as the game truly shines when its many parts must work together to reach the next level. The premise is simple. Your objective is to get all three characters from the left side of the screen, to the right side of the screen. On the way to the other side switches will have to be thrown, levers pulled, buttons pushed, and chasms jumped. It’s all standard fare for a portable puzzle platformer. But it’s the way the characters are implemented that set the game apart. 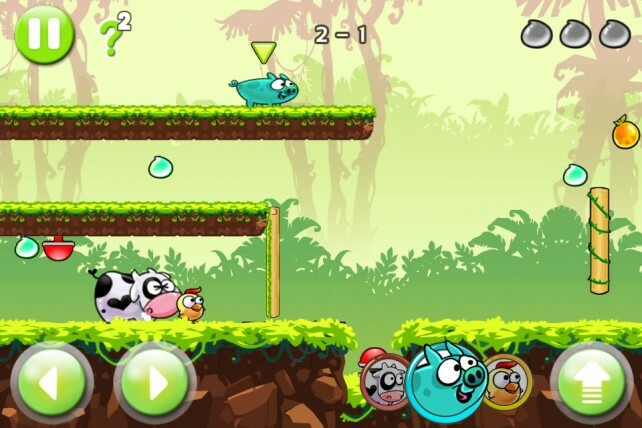 The aforementioned pig, chicken, and cow all have different abilities which help and hinder their traversal of the map. The pig is an all-rounder. Of medium size, he can run the fastest and jump the highest. The chicken is tiny, and can fit into places otherwise unreachable to his travel companions. And the cow is slow and lumbering, but can push heavy objects. And all of these characters can jump on top of each other to give themselves a boost. Yes. 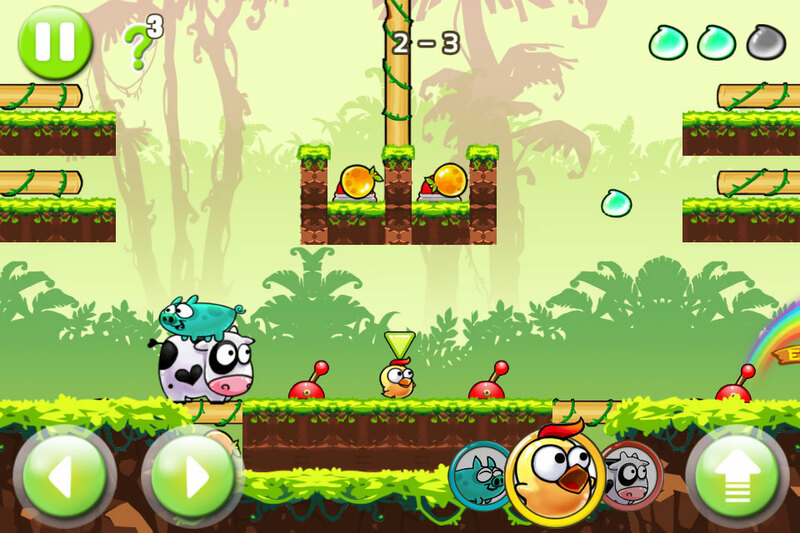 The cow can use the tiny chicken as a springboard. It’s because of their different traversal methods that the game becomes a unique experience. As a basic example, the pig may have to jump from on top of the cow to a lever placed high up. This will open a passage which allows the chicken to hit a button, which in turn creates a platform from which the cow can cross a chasm. As the game progresses through its 42 levels, the order of character movement and use of their unique abilities becomes more and more important, and towards the end there are some thoroughly mind-bending puzzles which include anti-gravity fields, swings, and the ever-dangerous moving platforms over bottomless pits. If you do find yourself stuck there is a helpful hints button. Unfortunately the “hints” would better have been termed “the answer key” because they show you exactly what to do. Thankfully, they’re on a timer so it’s not a limitless pool of solutions (however, if you like having answers given to you, you can unlock unlimited hints for another 99 cents). Each level also includes three drops of coloured paint the characters can pick up, and while they aren’t necessary to unlock new levels, they do add to your score, which you can share on Game Center. The game’s graphic style is nothing you haven’t already seen on a platforming app. Cute characters in a cartoony world is nothing original, but the game does do it very well. Little touches, from the pig dancing when it reaches the end of a stage, to the chicken wincing as the cow precariously balances on its head, add to the cute aesthetic the game is going for. The environments are varied and detailed, with the adventure taking the three heroes to jungles, deserts, and pleasant green hills, making sure the game’s presentation never feels repetitive. This is not where the game shines. Not that the audio is particularly bad, but you won’t be feeling like you earbuds have been treated either. 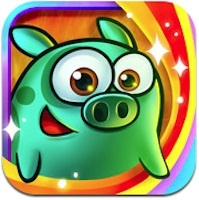 A playful tune plays when you begin and finish each level and characters will have audio cues based on what’s going on around them, but if you play Piggy Adventure, you will most certainly not remember it for its sound design. Piggy Adventure would have been a good, but average puzzle game had it not implemented the mechanic of multiple characters. But the way these characters’ abilities are used so effectively in platforming and problem solving sets the game above other games in the genre. The cute art style and thoughtful level variants completely enhance the experience, making this a solid entry into the app market. I hope to see more from MoboTap in the future.